Everyone wonders, why is it called Stocks? Allan Armitage explains it as referring to the flower's stiff stems. During the middle ages "Stock gillyflowers" were stiff-stemmed sweet flowers of romance, as opposed to weaker stemmed gillyflowers, I suppose. 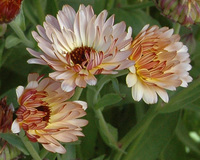 Because of a complex background of hybridization, all stocks are a mixture of single and double flowered plants. When grown at 45°F or less, seedlings of plants that will have doubled flowers look terrible (smaller, yellowed leaves and cotyledons) compared to plants which will have single flowers. The "flower industry" throws out the healthy seedlings in favor of doubled blooms. The cost of big beauty. An aside, the doubled flowers bear no seeds.